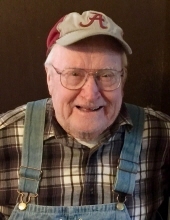 Celebrating the life of Franklin Tew Sr.
Obituary for Franklin Tew Sr.
Age 84 of Owosso passed away Wednesday, January 23, 2019 at Pleasant View. Funeral services will be held 11am Tuesday, January 29, 2019 at Nelson-House Funeral Homes, Owosso Chapel with Pastor Jack Tew officiating. Burial will follow at Hillcrest Memorial Gardens. The family will receive friends at the funeral home on Sunday from 4pm to 8pm and Monday from 2pm to 8pm. Frank was born February 3, 1934 in Blue Springs, AL, the son of Clifford Foy and Evie (Parr) Tew. He proudly served in the United States Army. Frank (Delano) was known as the candy man for his love of candy and always passing out candy through out the neighborhood to the kids. He enjoyed watching and cheering his favorite team Alabama! Roll Tide!!! You could see him in his Alabama gear where ever he went. He loved to be outside mowing his lawn or swinging on the front porch sipping on his southern sweet tea watching the cars go by on M52. Frank also enjoyed tinkering around and collecting antiques. Some may remember his business “Tew’s Crafts & Nick-Knacks” and maybe even bought a few from him. Most of all he looked forward to spending time with his family and going to his grandchildren's many sporting events and school activities. He married Barbara Ann (Bates) on October 1, 1966 at the First Church of Christ; she predeceased him on May 2, 2012. Frank retired from General Motors after 30 years of service in skilled trades. He is survived by his daughters Connie Tew and Lisa (Ron) Mayer; sons Frank (Lisa) Tew and John (Christina) Tew; grandchildren Kylie, Brendan, Nicholas, Rebekah, Travis, Leiah, Ashley and Tayler; great-grandchildren Jalen, Aybre, Laeni, Mikayla, Eugene, Myranda, Mariyah, Blake, Samantha and Payton; sister Lois Callard; brothers Cliff and Rodney Tew; many other loving family members and friends. Frank was predeceased by his wife Barbara, his parents and 6 brothers and sisters. To send flowers or a remembrance gift to the family of Franklin Tew Sr., please visit our Tribute Store. "Email Address" would like to share the life celebration of Franklin Tew Sr.. Click on the "link" to go to share a favorite memory or leave a condolence message for the family.